The Wave Music System III is undoubtedly sticking to its roots, showing a definite amount of courage to still make a music system pretty much the way it was throughout the 90s. Yes, there is no on-board Airplay or Bluetooth, and not even an integrated iPod dock. Bose charges a premium, and it is definitely a premium for that reassuring warm and rich sound. You really cannot go wrong with that, with the only caution being that this is one is slightly bass heavy, and may not really appeal to the neutral demographic. One look at the entire package, and you know you are in for a blast from the past. With Radio, CD and an AUX-in as sources, you are pretty much set to relive the olden days. But then again, you probably haven’t switched on the Wave Music System III as yet, and experienced the sound! Quite clearly, Bose’s designers follow the same design philosophy as the designers at the popular car manufacturer Porsche – if it ain’t broke, don’t fix it. Which is why the Wave systems retain the retro-ish look throughout. Added to that, Bose doesn’t really refresh products too often, which does make this update a big deal. 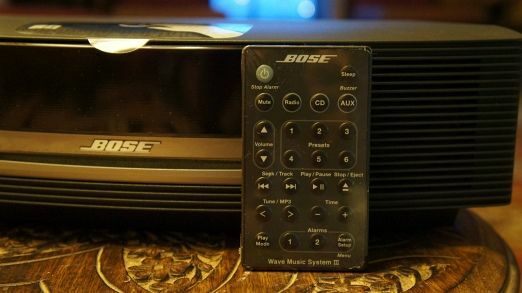 The Bose Wave Music System III’s design remains the same as the predecessor, which means the compact form factor is retained. 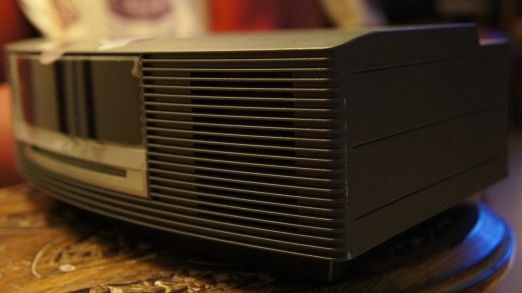 The sense of familiarity means the Bose fans that upgrade will not have any learning curve. The sheer simplicity of the design is rather interesting. On the front is the big display, lit up by green LEDs indicating stuff like the FM station frequency, source currently in use and any track details, in case they are available. Just below the display is the optical drive, with a grey border around it. The review unit that we received was the graphite one, and this is also available in Titanium Silver and Platinum White options. Either side are the speakers. The device and the remote. The Wave III is wider at the front, and slims down towards the rear. 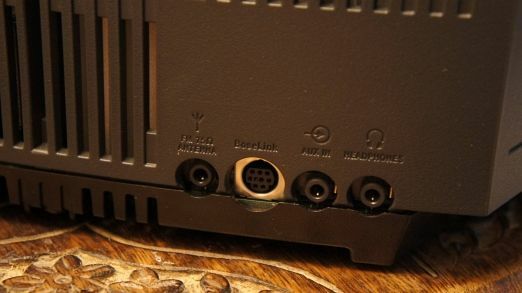 This is where most of the connectivity ports are – FM antenna input, AUX-in, headphone out, and BoseLink connector for external accessories. 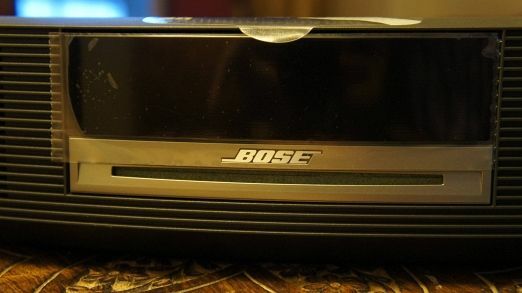 On the top of the Bose Wave Music System III is the touch sensitive Power on/off control, and that is probably the only control on the device that is mostly remote dependent. But the positive side of that is the clean and uncluttered look that is on offer. There is nothing bold about this design, except that it is sticking to a minimalist classy design without regrets! The only niggle we can pick with the Bose Wave Music System III, and this is only because of the price, is the use of plastic throughout. Very good quality plastic, but it is still plastic. When you are paying so much for a product, we would have expected a dash of metal to give it a more expensive look. Currently, while there is nothing wrong with the design element, the Wave III doesn’t look as expensive as it should. And a tweak in the materials used would have made all the difference. The edgy yet contoured design looks good, without being very bold. The biggest update over the Wave Music System II is the improved AM/FM tuner in the Wave Music System III. The FM antenna runs within the power cord, which is something rather neat. There is still a port for an external antenna, in case you need one. Connectivity options on the back, including the optional iPod dock. 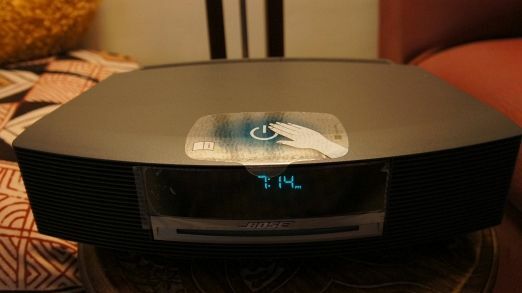 For what is a glorified alarm clock, the one on the Bose Wave Music System III does the job rather well. 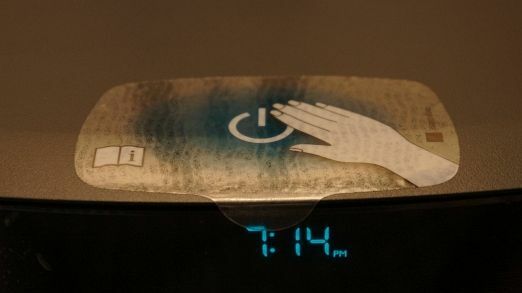 You can set two alarms simultaneously, and can also be turned off/snooze using the touch sensitive control on the top. We like the simplicity of the Bose Wave Music System III, in terms of the setup and daily usage. This is essentially plug and play, and for anything that plays back audio, that is a huge achievement, one that is helped to a large extent by the lack of manual audio tweaks that you wished for. Bose’s philosophy is that the moment you get to manually tweak audio output, the chances of it getting ruined are more probable than anything else on the planet. And we tend to agree with that philosophy, which is why our iPods run on the default “no equalizer” setting! The touch sensitive power and snooze key on the top. For a system that is largely dependent on the wireless remote for functionality, the tiny credit card sized remote does remain rather uncluttered and isn’t overwhelming. 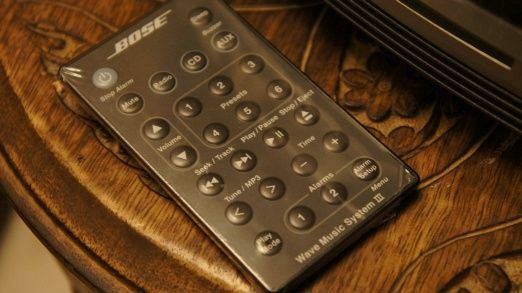 All the functionality is here, helping clean up the look of the Bose Wave Music System III remote itself. 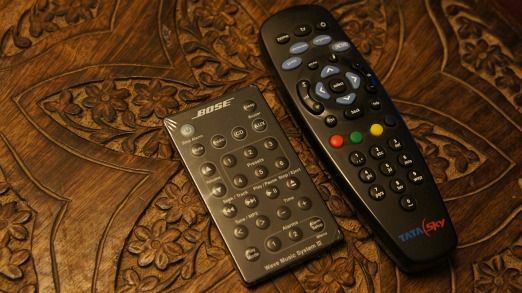 For those who are cribbing about the lack of controls on the system itself, just think of it this way – how many times do you use the controls/buttons on the TV as compared to the remote? Before people start comparing this to a 5.1-channel setup, for example, it is important to understand that the Bose Wave Music System III is a one-piece music system and that is all it is. Having said that, within those limitations, the sound quality is absolutely brilliant. This one has more bass thump than the previous generation Wave Music System, and that is definitely going to enhance the appeal of this device among a wider demographic of users. With the enhanced bass, the Wave III sounds good with almost anything you throw at it – rock, pop, hip-hop and even trance for the most part. The remote is extremely well built. 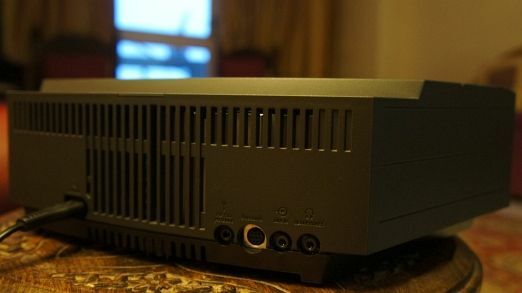 Bose has never been very open about the internals of their speaker systems, but this time around, they did let slip the term “Proprietory WaveGuide speaker technology” at the time of announcing this product. That is the biggest reason why the sound on this version has more bass punch than before. The depth of sound is amazing as well. While listening to some old Hindi songs on the Wave III, we were pleasantly surprised to hear them sound so rich and full, something that isn’t present with most speakers. Never did we realize that these songs had so many layers to them, as the Bose made me realize! However, there are times when you do feel the treble isn’t enough on the Bose Wave Music System III. Particularly when you push up the volume, the sound seems to be enveloped with the logic being to not make it sound to sharp or distorted. You may not like this if you are using this system for anything that is more speech-based than music, like a chat show. Having said that, even at high volumes, there is no jarring or distortion of the audio, something that is a credit to the rather compact system. And the volume punch is more than adequate for a medium sized room. The minimalistic design on the front - the display and the optical drive. The enhanced FM reception did make a difference. The rest of the radios placed in the same room needed an external antenna for the best possible reception, the Bose Wave Music System III is powerful enough to work with the internal antenna without any disturbance at all. Unfortunately, you do feel shortchanged when you connect an AUX source. Instead of using the on-board sound processing, the Wave Music System III uses the audio processing directly from the source connected – MP3 player, smartphone etc. The sound, in comparison to direct playback off a CD or even FM Radio, does sound slightly weak. That translates into the volume punch starting a bit higher up the volume curve than usual. Generous vents on the back. We will, for a second, assume that you are in the market for a premium audio product with an equally flashy brand name attached with it. Hence, we will compare this directly with the Bowers & Wilkins Zeppelin Air. We agree that the two devices are meant for different tasks, but bear with us for a minute! For relatively similar price, the Zepplin Air does away with the FM Radio and CD playback bit, but offers AirPlay for wireless audio streaming. Sound quality wise, there really isn’t much to quibble about, considering how brilliant these two products are in their price bracket, barring the odd shortcoming. Ultimately then, it does come to the feature set that you may want. If it is simplicity that you want, something my dad prefers over a gamut of fancy features any given day, then you would probably prefer the Bose. You can connect the iPod to it via AUX-in, if you don’t want to buy the dock. And when it sounds so good, what is not to like! Very slim no doubt, and this will give you an idea of the dimensions of the Bose remote. Parameters to look for finding Best music system for Home?